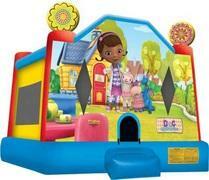 You'll feel better, so much better when you book this Doc McStuffins bounce house! Featuring Doc, Hallie, Chilly, Stuffie, and Lambie; your kids are sure to enjoy every jump and bounce! Dont let your party get put in the "Big Book of Boo-Boos"...book today! We will bring the Doc-mobile and deliver this jump to you. The Doc is in! La la la la, La la la la...Elmo's World! From Sesame Street to your backyard! 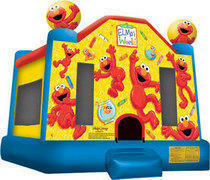 The all new Elmo bounce house has arrived! The Elmo bounce house artwork will have your tot laughing and having a bouncing good time in his World with Dorothy and plenty of crayons to create a magical space. "M-I-C-K-E-Y-M-O-U-S-E" It's the Mickey Mouse Club House! Join Mickey, Minnie, Daffy, Daisy, Goofy and Mickey's faithful pup, Pluto in your very own Mickey Mouse Clubhouse. Jump alongside Mickey and his pals in this large 15x15 moonwalk. A pair of trademark, three-dimensional Mickey ears helps show the way, and sharp, colorful artwork make participants feel like they're right there in the Magical Kingdom! The fairy tale comes to life on this fabulous pink and white castle. Let your princess be inspired by this VERY pink addition to our bounce collection. 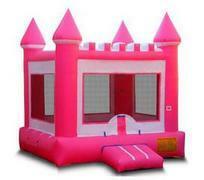 With 170 square feet of pure pink bounce, your little girl will love The Little Pink Castle. Our large 15x15 Pony moonwalk is a great addition for cowboy or cowgirl themed birthday parties, rodeos, or any western themed event. 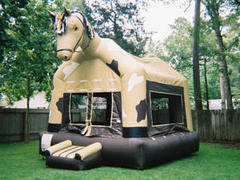 This giant pony provides 210 square feet of pure bounce for participants to jump for hours on end. These jumpers have mesh windows, so parents and spectators can have a clear view of all the fun. Jumping is a great way to promote healthy activity for kids of all ages. 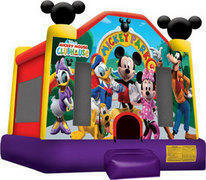 Our Extra-Large Fun House gives an extra amount of bouncing fun for any event. This super spacious bounce house provides more than 300 square feet of pure bounce! These jumpers have mesh windows, so parents and spectators can have a clear view of all the fun. Jumping is a great way to promote healthy activity for kids of all ages. The Classic Fun House is the ideal amount of bouncing fun for any event. With more than 150 square feet of pure bounce, the Classic Fun House will keep kids entertained for hours on end. Parents and spectators have a clear view of all the fun through 360-degree mesh windows. 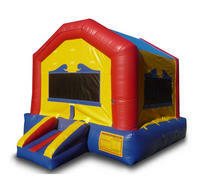 This large moonwalk is also available in a more spacious extra-large size, only from Hullabaloos Bounce House Rentals! This 15x15 bounce house accommodates 8-10 children at a time. Our Large Jump House provides 240 square feet of pure bounce for participants to jump for hours on end. These jumpers have mesh windows, so parents and spectators can have a clear view of all the fun. Jumping is a great way to promote healthy activity for kids of all ages.